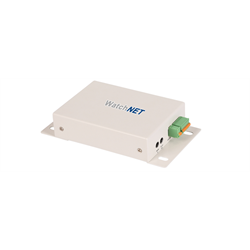 WatchNET’s AVCNAB SIP based Audio Box is a dedicated high-performance digital amplifier that can be used for a variety of audio related tasks in a SIP intercom system. The built-in 3.5 watt amplifier can be used for a variety of tasks such as having indoor/outdoor speakers be used for paging or be used as a centralized music distribution system. When a microphone is hooked up to it, it can be used for two-way audio communication. DSP integrated echo cancellation and noise suppression helps in providing clearer vocals.